It's Black Friday! Have you done your beauty shopping? Well it's almost over, and of course I'm gonna talk about Sigma Beauty! Today only you can get free shipping WORLDWIDE Use coupon code BF2011 for free shipping today only! And of course, Sigma has launced their new brush line, The Cities Collection. 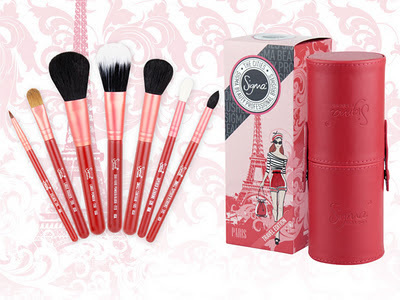 Glamorous and fashionable, this collection features seven travel-size brushes from Sigma Beauty's best-selling Essential and Premium Kits (E05 Eyeliner, E35 Tapered Blending, E45 Small Tapered Blending, E60 Large Shader, F05 Small Contour, F15 Duo Fibre, and F30 Large Powder). The brushes come in an innovative and functional travel-size container that turns into two brush holders to keep you stylish and organized on the go. Each kit was designed to represent the beauty and excitement of the city it is named after. And as always for the month of November use Sigma coupon code PSW2011 for 10% off. However this coupon code cannot be used with the free shipping for Black Friday. So anytime after Black Friday this will be good in month of November!